The first thing you'll notice when you pop the third volume of Noir into your player is that there are only three episodes on this disc, despite the fact that the retail price (a hefty $29.99) remains unchanged. Volumes One and Two had five and four episodes respectively, but ADV made the controversial decision to stretch the series to seven discs (instead of the usual six), which means every other volume from here on out will have only three episodes. 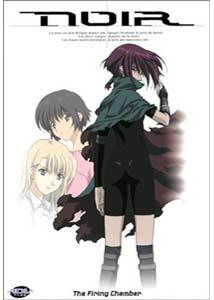 I suppose such a recent series carries with it a higher licensing fee (ADV is also spreading 2002's RahXephon over seven discs), but it's frustrating for the anime fan (and yes, I know subtitled VHS volumes with two episodes used to cost $30, but times have changed). Despite the drastic reduction in running time, this is still a fairly decent installment of this action-packed series about two assassins with an ancient destiny. Killers Mireille and Kirika (who together go by the codename "Noir") have been working to piece together mysteries in their past, all of which seem to tie into a shadowy, all-powerful group known as the Soldats. In The True Noir, they come face to face with a member of the organization when they encounter a new character, Chloe, who works for the leader of the Soldats and claims to be the true heir to the "ancient destiny" of Noir. She's also really good with knives, as in, she's really good at killing people with them. It appears that the Soldats still want Kirika and Mireille dead in Moonlit Tea Party, because they kill off an informant within their ranks who was going to give the girls an ancient book of prophecy and send about 15 armed men in his stead. Later, Chloe stops by for a tense tea party with the assassins, and it seems she may be more than just a servant of the Soldats. Finally, Chloe takes center stage in Assassination Mission (stars Kirika and Mireille don't even appear) as she carries out a few last missions before returning to her home to Altena, her mother figure and perhaps the leader of the Soldats. She operates a little differently from our heroines, spending a few days getting to know her target before offing him. Her target, meanwhile, doesn't seem to mind when she waits two days after announcing that she's there to kill him. Weird. Story-wise, this volume is a little muddled. Chloe is an interesting, well-designed character, but her purpose is unclear as of yet, and though there is a lot of talk about the "true Noir" and the Soldats, no answers are provided (not unsurprisingly, since we've got four volumes to go). The action scenes are as impressive as ever, though, with Chloe in particular getting to do some fancy death dealing, and the music and European scenery remains a nice change of pace from your typical anime. Image Transfer Review: This is another great looking volume of this 1.78:1 anamorphic widescreen anime. Colors are spot on and show no blooming or bleeding. Blacks are deep and show good shadow detail. Fine detail is excellent, showing off the intricate animation quite nicely. I noted no artifacting, and just a touch of aliasing in a few shots. Audio Transfer Review: Audio is offered in either Japanese or English 5.1 DD. Dialogue on both tracks is clear and anchored primarily in the center channel, and sound effects and the score are positioned nicely across the front soundstage. The surrounds enhance action sequences nicely, offering immersive gun battles and a directional presentation of the score. Extras Review: This volume receives the same batch of extras as the previous two, with one noteworthy addition. Of course, there are the requisite Japanese promos, the brief gallery of production stills, and the clean open and closing animations, but there is also a brief interview with Japanese voice actress Houko Kuwashima, who plays the part of Kirika. They take anime dubbing very seriously in Japan, and the insider perspective is most welcome, though some of the questions are pretty fluffy ("What was your most memorable line?"). ADV trailers this time around include Full Metal Panic, Saiyuki, RahXephon, Neo Ranga, Rune Soldier, and Sakura Wars TV. Noir drops the episodic format for a disc to focus on the overall story arc, but it's too soon in the series for any real answers, so these episodes provide only frustrating, tantalizing hints as to what's coming. I'm not happy that an episode was dropped from this volume in order to stretch the series to a seventh disc, but the audio and video quality is on par with what I'm come to expect from ADV.